We spent an amazing evening with Bruno Fonseca the chef and general manager of Millenia 106 last night, and we are very pleased to say that it looks like this restaurant is going to be one of the most promising restaurant openings of 2017. The modern interior has a casual relaxed vibe and complemented by a serious cocktail bar, theater kitchen, chefs table, raw oyster bar and separate area for events, meetings or private parties. Bruno hails from Brazil and in particular Rio, so his love of amazing breads, fish and meats is ingrained in his heritage DNA and totally reflected in the food he and his dedicated brigade prepare and serve. His credentials are impressive but there are many chefs out there with great credentials but without talent, Bruno is NOT one of those, not resting on his laurels or looking back at past glory he likes to say “His story is the food he produces” and he does produce some amazing and creative food. Bring all your senses when you dine here, as they all will be utilized in the appreciation of simple food excellently prepared and cooked to perfection. 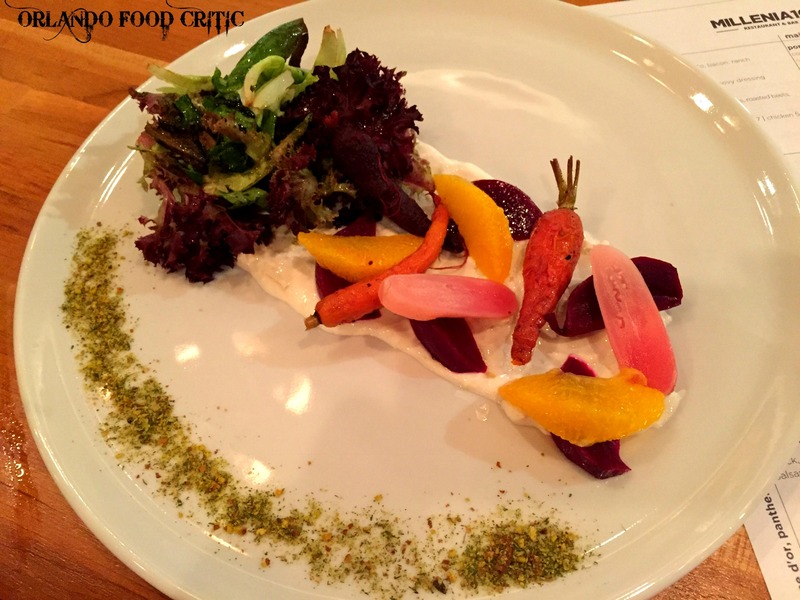 Salad 106 – Garden greens, tomato, spiced carrots, roasted beets, herb soil, orange & sherry vinaigrette. I have been known to be somewhat of a salad dodger, but this seemingly simple salad set my taste buds on fire, the preserved lemon in the dressing had me at first bite and each item had its own story of production and owned its place in the combined dish. Miyagi Oysters – A pacific North West Oyster served with watermelon mignonette. Even the shell on this Oyster was beautiful and just the right size (not too large) The Mignonette let the mild briny flavor shine through and did not mask the taste as more aggressive dipping sauces can do. Spread – Chicken liver mousse, onion pickle and toast. Firstly, to say “Toast” belies the excellence of this staple product from Pane d’or bakery, add this to a first-class chicken liver mousse and accent with onion pickle and you have winner. One of our favorite courses. Portuguese Surf & Turf – Confit of pork belly. fish collars, royal red shrimp, “murro” potatoes and sofrito. This is a dish that truly reflects Bruno’s heritage and skill, classically paring pork with delicate fish from the superbly cooked collar and the crown jewel of Alabama, royal red shrimp. “Murro” potatoes, a Portuguese garlic lightly crushed potato completes the dish. Gnudi – House made Gnudi pasta (very much like Gnocchi), braised chicken, arugula, bacon, pine nuts, Clermont snap peas, local greens and gremolata. Succulent chicken and pasta, what’s not to like. 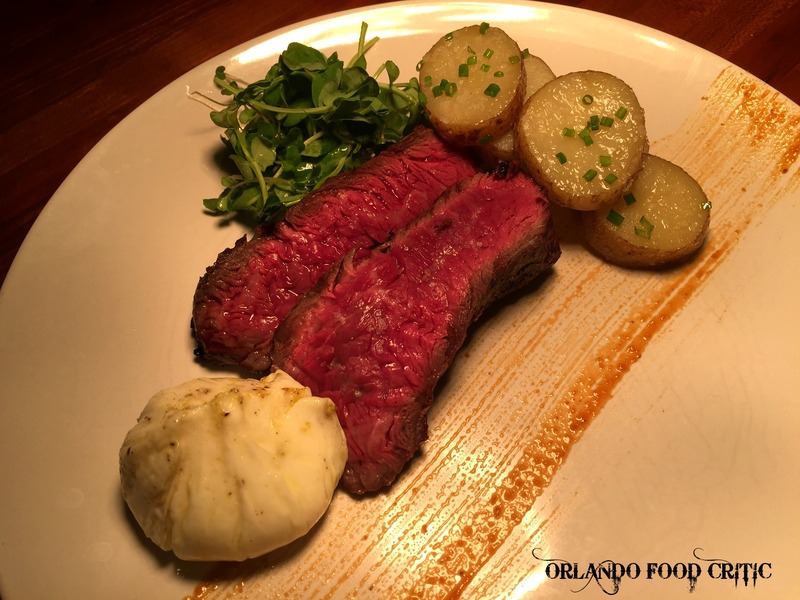 Steak & Egg – Grilled hanger steak, arzak egg (poached), confit potatoes, greens and house sauce. Let the egg ooze over the exact medium rare cross cut hanger steak, relax, repeat, enjoy! What do we want you to know about Millenia 106 ? Bruno and his brigade leave all their skill on the plate, I doubt you will get better food anywhere and especially not at this price. Millenia 106 is CASUAL dining, just with great food and no pretention. They have a great cocktail bar, wine and beer selection. A great place to hang out, with “Happy Hour” 4.30pm to 7.30pm Tuesday to Saturday. Great cooking skills are not easy to achieve, balancing flavors, modern and classical cooking techniques, sourcing quality produce with provenance takes dedication, experience and expertise. Come to Millenia 106 and see how Bruno achieves these standards with seemingly effortless ease, take it from us it’s well worth the visit.